Saturday, April 15 at 8 p.m. in Lowell Lecture Hall and Friday, April 28 at 8 p.m. in Harvard Dance Center. Tickets available through the Harvard Box Office, (617) 495-2222. $6 students; $10 for general. For those audience members who might think that the title of the Harvard Ballet Company’s (HBC) spring show, “Pointe/Counterpointe” is simply a clever, if slightly hackneyed, pun, HBC’s Facebook group promoting the show assures that such is not the case. 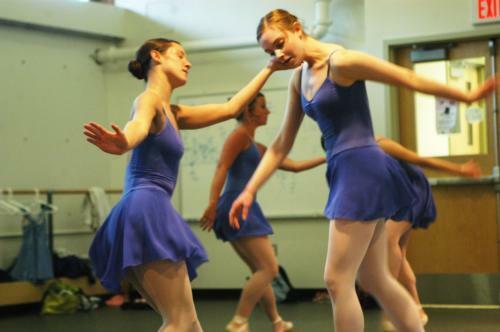 According to a blurb on the website, the show will fulfill viewers’ hopes if they have “ever wanted to see what happens when ballet dancers took off those pointe shoes.” Indeed, “Pointe/Counterpointe” promises to be a mixture of classic, contemporary, and modern dance styles, providing a chance for Harvard audiences to see the more informal face of ballet. That doesn’t mean, however, that HBC’s trademark classical technique won’t be on display this weekend. “We’re putting on an ambitious program with several new works by reputable choreographers,” explains HBC Secretary and performer Joanna R. Binney ’08. With many dancers coming in with anywhere between eight and 12 years of training, and some joining the company with a few years of professional experience, the HBC is highly steeped in the classical tradition. The show’s so-called “counterpointe” will be provided by two student-choreographed pieces that diverge a bit more from the traditional canon of ballet—a modern piece by Larissa D. Koch ’08, and another by this year’s winner of the Suzanne Farrell award in dance, Molly M. Altenburg ’07. It will also feature an Irish dance sequence sure to ruffle a few tutus, and allow the dancers to exhibit a more informal side of ballet. In that same vein, the second performance slated two weekends from now is said to be an “informal showing” that should give the audience an “informative, behind-the-scenes feel,” according to Binney. So whether would-be viewers have never fully gotten into the more traditional form of ballet, or whether they still place great emphasis on pirouettes, plies, and perfectly pointed toes, “Pointe/Counterpointe” promises to offer something for everyone.